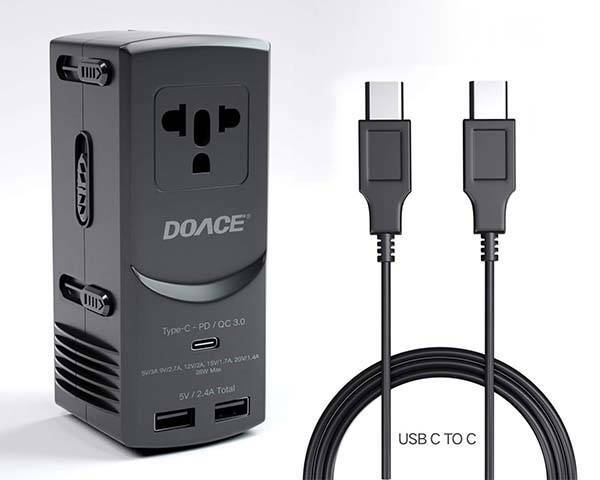 Doace universal travel adapter works in more than 190 countries, and integrated USB-C wall charger conveniently charges your mobile devices. Like the idea? Let’s keep checking. This is a multi-functional world travel adapter that measures 4.5 x 1.92 x 1.92 inches and weighs 10.2 ounces. As we can see from the images, the adapter shows off a low-profile and compact form factor so that you can easily store it in your bag for any trip. 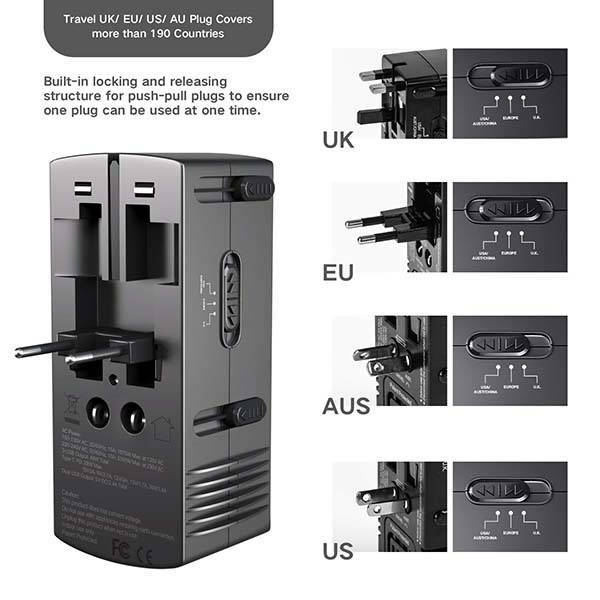 The travel adapter features a US/EU/UK/AU plug combo in order to work in over 190 countries, and its built-in locking and releasing structure allows you to access to every plug type with ease. The three-prong outlet supports 100-240V 50/60Hz output. Furthermore, it serves a USB-C wall charger with Power Delivery 3.0 in order to safely and efficiently charge your mobile devices such as iPhone XS, iPhone XS Max, MacBook and more. Using two extra USB ports with 2.4A output, it’s capable of charging up to 4 devices at the same time. Moreover, the travel adapter also features built-in over-current, high-temperature, short-circuit and surge protection, and its 8A fuse ensures complete protection for you and your devices. The universal travel adapter with USB-C wall charger is priced at $39.99 USD. If you’re interested, jump to the product page for its more details.